This article explains the step by step process to configure and show estimated delivery dates for WooCommerce USPS Shipping. 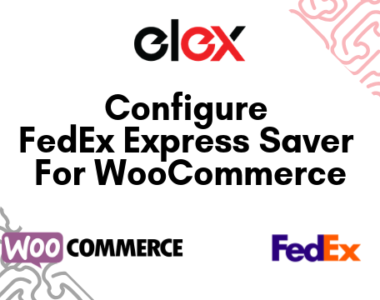 We will use ELEX EasyPost (FedEx, UPS & USPS) Shipping & Label Printing Plugin for WooCommerce to integrate these shipping carriers with WooCommerce. Moreover, this plugin can also be configured to show the estimated delivery dates for FedEx and UPS. EasyPost is a shipping API that helps to integrate the products and services of major shipping companies like USPS, FEDEX, and UPS. The API is fast and flexible. The plugin uses the EasyPost API to configure shipping and tracking for your WooCommerce store. 1. EasyPost account and API keys: EasyPost is an API provider for integrating shipping methods and services like tracking from multiple shipping carriers like USPS and FedEx. To run the plugin you will need to have an EasyPost account. From your account, you can access the API keys. Additionally, EasyPost provides two types of API keys: a test key to test out all the features and a live key for live websites. 2. ELEX EasyPost (FedEx, UPS & USPS) Shipping & Label Printing Plugin for WooCommerce: This plugin uses the EasyPost API to integrate FedEx, UPS & WooCommerce USPS shipping methods and services. You can also read how to download, install, activate ELEX plugins. Once installed and activated, you will have to configure the plugin through the settings. 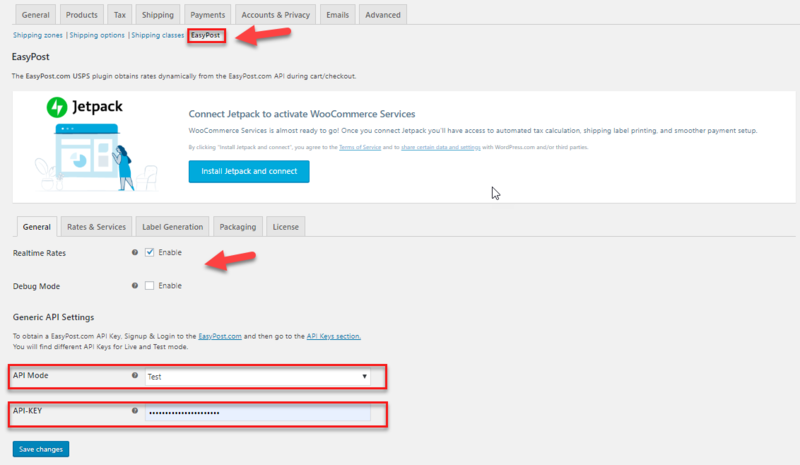 These can be accessed from WordPress Dashboard > Plugins > Installed plugins > ELEX EasyPost WooCommerce Extension > Settings. This opens the general settings tab of the plugin. Here, you can enable or disable live rates as well as a Debug Mode for testing purposes. In the General API settings, you can set the plugin to run in test mode, for which you give the test API key from EasyPost in the API-KEY field. Else you can run it in Live mode by giving the Live API key. This can be found in your EasyPost settings. Once done, click on Save Changes. In the Label Generation Settings, you can choose the format of the generated shipping labels. The plugin lets you choose from four formats: PNG, PDF, ZPL, and EPL2. Apart from this, Insurance can be activated and configured using the Insurance field. This can be set to either mandatory where insurance is applied to all products being shipping by default or let the customers choose at checkout. EasyPost charges a set amount or percentage of the price of the product. Additionally, you can disable the EasyPost insurance to enable the shipping carrier insurance instead. Using these settings you can set default Domestic and International Shipping Services. 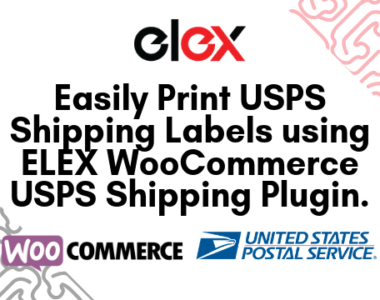 ELEX EasyPost (FedEx, UPS & USPS) Shipping & Label Printing Plugin for WooCommerce lets you choose these defaults from all three shipping carriers. Moreover, using the ELEX WooCommerce EasyPost Bulk Label Printing Add-On lets you handle bulk printing more efficiently. 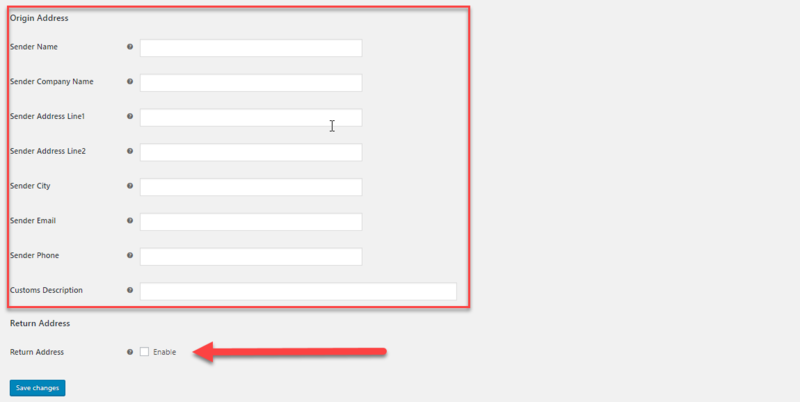 Using the Origin Address fields you can set up the address that appears as the sender’s address. Also, there’s a special field to enter a product description that will be used at Customs when shipped. You can also choose to enable a Return Address that is different from the Sender Address. Clicking the checkbox lets you enter the address details that will be used to ship your returns. You can also configure how your items are packaged into parcels for shipping. Using the Parcel Packing field you can pick one among three packaging algorithms. By default, it is set to pack the items individually, but you can choose to either pack items based on weight or pack based on the item dimensions as well as weight. This ensures the best packaging for your FedEx, UPS and WooCommerce USPS Shipping. From this tab, you can configure critical components of the plugin like choosing which carriers shipping services and options used by the plugin. Under the Carrier & Rate Settings section, you set up a Fallback rate that is used when EasyPost is unable to return the rates during checkout to ensure the transaction can go through. The shipping carriers have different rates depending on whether the address is Residential or Commercial. Additionally, the Rates Type field lets you choose between Residential and Commercial rates for all price and tax calculations. 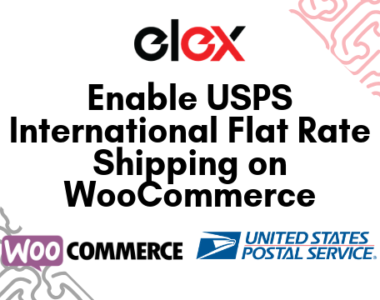 The ELEX EasyPost (FedEx, UPS & USPS) Shipping & Label Printing Plugin for WooCommerce supports all USPS WooCommerce shipping methods and services including USPS Flat Rate boxes. Additionally, you can pick out all the different USPS Flat Rate Boxes, set a custom label for the flat rate and set a fee for it as well. Moreover, the plugin allows setting up separate rates for both domestic and international USPS WooCommerce Shipping methods as well. You can enable or disable FedEx, UPS and USPS estimated delivery dates for WooCommerce from the Rates & Services tab. First, make sure you have chosen the EasyPost shipping carriers you need in the settings. In the Rates & Services tab, under the address fields, you can find the Estimated Delivery Date Settings section. By ticking/unticking the checkbox, you can enable or disable estimated delivery dates for your customers. Depending on how you have the settings configured, the shipping method/option picked by the customer and the destination address, the plugin sends an API request to EasyPost for fetching the estimated delivery date. What’s more, during checkout the customer can see the estimated shipping dates. This lets the customers choose the shipping method based on how soon they would like to receive it. 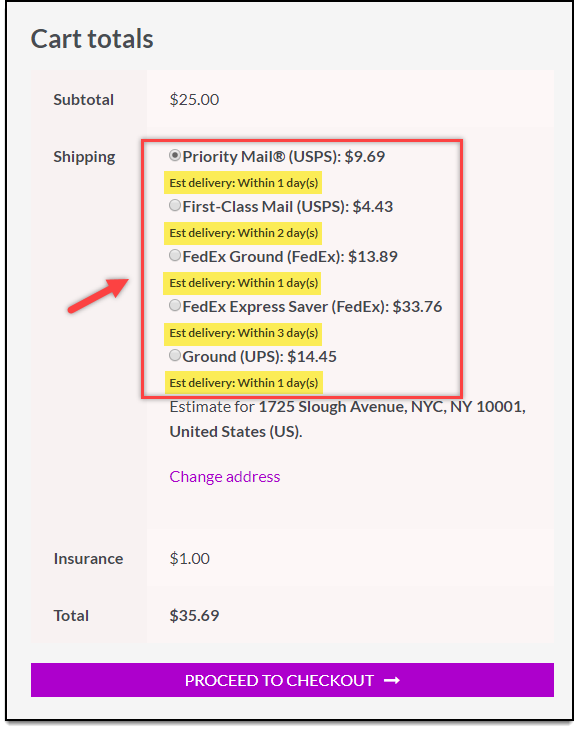 Once configured the estimated shipping rates for UPS, FedEx, and WooCommerce USPS shipping are visible to your customers at checkout. As you can see the calculated estimated delivery dates are now visible under all the shipping methods for this product irrespective of the carrier. This is how you can enable UPS, FedEx and USPS estimated shipping delivery dates for WooCommerce. 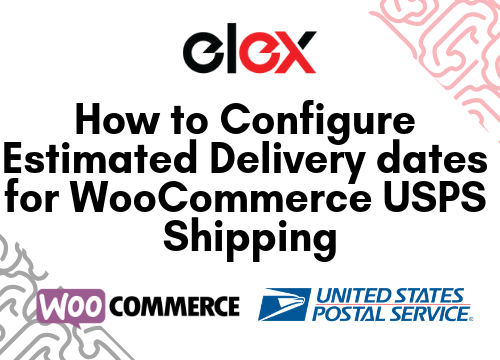 The ELEX EasyPost (FedEx, UPS & USPS) Shipping & Label Printing Plugin for WooCommerce is the perfect tool to integrate UPS, FedEx, and USPS WooCommerce Shipping Methods. You can find more information about the plugin and a breakdown of its feature on its product page.